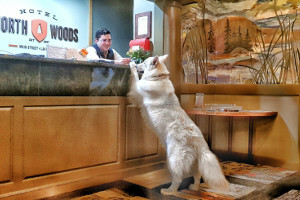 Not only is Hotel North Woods the perfect place for the whole family, it even welcomes your furry friend. This premiere historic hotel is located in charming downtown Lake Placid, appropriately named one of the 20 “prettiest towns” in America, according to Forbes. Hotel North Woods has a program called Outward Hound, which was created in order to ensure your pets have a great vacation as well. 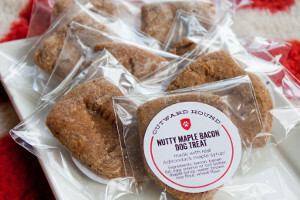 The program includes use of their signature, custom pet beds and pet dining stations, as well as a complementary homemade Nutty Maple Bacon dog treat. The official Official Outward Hound Canine Ambassador, Liberty, is often on property to welcome guests. “Our Outward Hound program is unique in the industry as it goes well beyond being pet-tolerant and is truly pet-friendly,” said Tracy Smith, owner and marketing manager. With its proximity to so many mountains, Lake Placid offers various hiking trails for all ability levels. With only a 15-minute drive from your hotel room, you have no excuse to miss the most breathtaking 30-minute walk in the Adirondacks. High Falls Gorge contains four waterfalls shooting over rocks and a crevice carved a billion years ago by ice, water, and wind. Mirror Lake is only a five-minute walk from the hotel, making boating, swimming, fishing, and more easily accessible. The hotel provides each guest a guide to pet-friendly locations and hikes in and around Lake Placid, making it easier to plan their days with their four-legged friend in mind. Grab your family and your dog and explore the natural wonders of the Adirondacks. With stunning lakes and mountains only minutes away and fine dining, shopping, and entertainment only an elevator ride away, Hotel North Woods provides the best of both worlds. Lake Placid is the two time home to the Olympic Winter Games, giving visitors the opportunity to tour the Olympic sites and experience ski jumps, take a bobsled ride, and on many occasions, see Olympic athletes train. When you and your family are ready to grab a bite, check out two onsite dining options at the hotel, including Delta Blue, a southern-themed restaurant offering Memphis-style barbecue, Cajun cuisine and live music every week, and The Cabin Grill, serving classic Adirondack breakfast. Both restaurants allow pets on the outdoor patio so don’t worry about having to leave them behind. If you would like to try out one of the delicious restaurant on Main Street, many are also pet-friendly. It is not easy to find a hotel so accommodating to pets, so don't pass up the opportunity to plan your pet-friendly Lake Placid vacation today! Exciting Family Getaways for the Fall and Winter!